Okay, everyone please be patient with me — I am a newbie. This is my first blog post and I am not on Facebook, Twitter, YouTube, Instagram or Snapchat. I met my husband the old-fashioned way — over a garbage can filled with grain alcohol punch — not online through Tinder or eHarmony. That being said, it may be a surprise when I tell you that I am a big fan of a website called Airbnb.com. This means that when planning a trip, I search online for accommodations in a person’s home, instead of a hotel. I enjoy it for many reasons, first being the range in size and price, but you would be surprised how much more interesting it can be than a Hampton Inn guestroom. 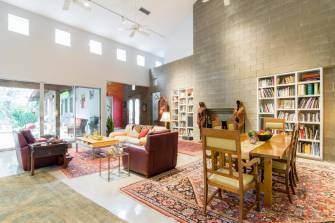 During the 2015 Texas Society of Architects (TxA) Convention, Mark and I opted out of the convention hotel and stayed at the home of a woman who is an amazing artist, best known for her public art commissions. If you've ever flown out of Love Field, you may have seen her installation, “North Texas Sunrise”. 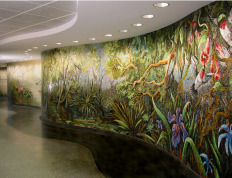 If you've flown our of George Bush International, you may also have walked past her mosaic mural of the “Houston Bayou”. Her home, inside and out, was inspiring and she, as a hostess, was warm and generous. 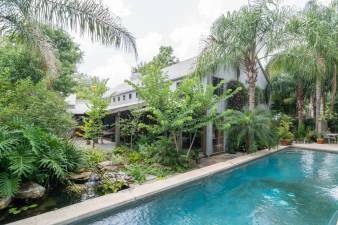 We were only 5 miles from downtown Houston, in The Heights — a quick trip via Allen Parkway or Memorial Drive along Buffalo Bayou. Avoiding I-10 is just one of those perks of staying with a person willing to give you useful recommendations. We had our own quarters with a loft, bathroom, and choice of two bedrooms, in addition to full access to the common areas of the house. Breakfast was provided in the kitchen in the morning and a glass of wine was offered in the garden in the evening. This was all for the amazing price of $79 per night! There are Airbnb listings throughout the world, not just in the United States — each one unique. So, when planning your next trip, whether business or pleasure, I highly recommend you check out Airbnb.com.